Every sperm may or may not be sacred, but every spermatogenic cell is subject to transcriptomic analysis, now that single-cell technology is available. A case in point: scientists based at the University of Texas at San Antonio (UTSA) have used single-cell technology to study changes in gene expression that occur in stem cells that differentiate into sperm. The scientists report that they have distinguished 11 cell types on the basis of transcriptomic profiles. Additional work, the scientists suggest, could inform research into male infertility and male contraception. The scientists even expressed optimism that their work could lead to sperm cells being generated in a dish. Dr. Herman is the lead author of an article (“The Mammalian Spermatogenesis Single-Cell Transcriptome, from Spermatogonial Stem Cells to Spermatids”) that appeared November 7 in Cell Reports. 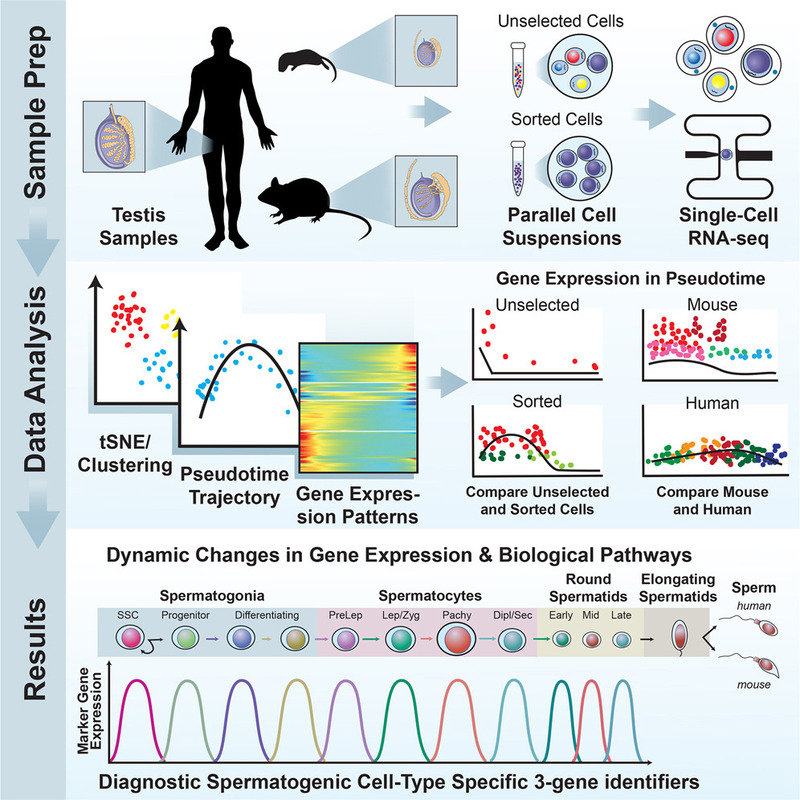 The article notes that while patterns of gene expression had been described for aggregates of certain spermatogenic cell types, the full continuum of gene expression patterns underlying ongoing spermatogenesis in steady state had remained unclear. To address this shortcoming, the team built a comprehensive digital library of the cell types required for sperm production in mice and men. They examined more than 62,000 cells and identified 11 different gene expression profiles; their work even uncovered rare and new cells for which little data was previously reported. The researchers are hopeful that the methodology can also be applied to other biological processes in the body to uncover new information on which to base novel approaches to diagnose, treat, or prevent a wide variety of diseases.